A Great Getaway…and our first Giveaway! | Vermont Paddle Pups! A Great Getaway…and our first Giveaway! How about we call it a celebration? A celebration of paddling season’s solid return? Or our acquisition of a new member of the fleet? Or a successful spur of the moment canoe camping trip? Or our first Bald Eagle sighting of the year ( while paddling)? Whatever the reason, we’ve decided to share some of our winnings with our blog followers. Additional information on how to enter is at the end of this post. Last weekend, on a lovely, cool, and sunny morning, we decided to head out to one of our favorite local paddling spots, Green River Reservoir. The park had not officially opened, so we had a 1/4 mile carry down to the launch site, proving once again that our canoe cart was one of our best investments. Heading down to the launch site…. There were quite a few early season paddlers about, and everyone seemed in great spirits, happy to once again be taking advantage of this beautiful resource. We saw loons, from a distance…they were in a clearly marked loon nesting area, so we studiously avoided that part of the lake. We checked out a few of our previous camping spots, excited to realize that in a few weeks we’ll be back here, tenting on one of the best spots in the park…making reservations in January is definitely worth it! The dogs were relaxed, and demonstrated how much they really enjoy canoeing. We got a bit of a workout, though, as the winds picked up, and we began to see small whitecaps. We adjusted our course a bit, laughed as we rode the swells, and had a great time with some early season wind practice. A very relaxed paddle pup…. So happy to be back in the canoe! Gryphon was able to try out his new Ruffwear K-9 Float Coat, which we are testing this month, for http://backcountryk9.com/ He seems very comfortable in this life jacket, and I am very impressed with its workmanship. 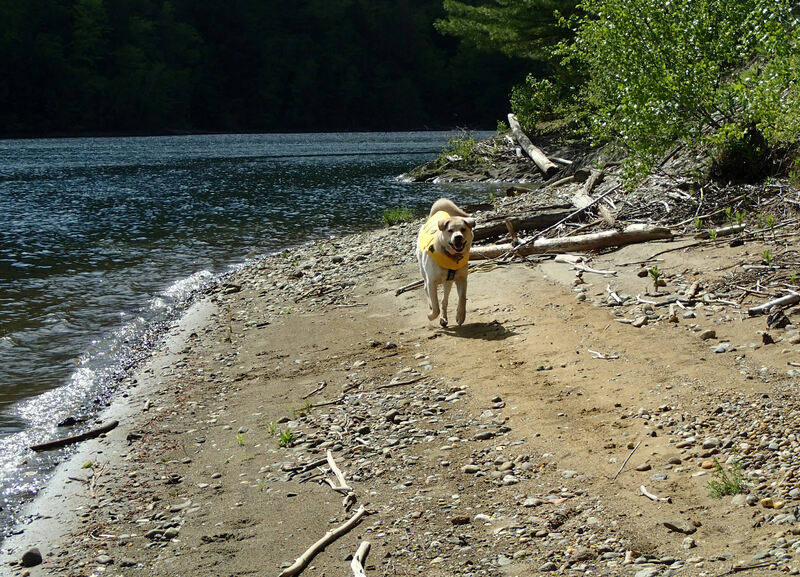 We will continue to test it out, including having Griff swim while wearing it…a review will follow in a few weeks. On the way home, we stopped by our local outfitters, so that my husband could try out a used kayak. Due to his height, a standard single kayak does not have the leg room, or cockpit space suitable for he and Edgar to paddle comfortably. The solution was found, in a Necky Sky 2 tandem kayak, with the front seat moved back as far as possible, and the rear seat base left in for structural reasons only. They gave it a whirl on the pond behind the shop….Edgar had a great time, and seemed to love being the figurehead of the boat! So our fleet now consists of two canoes, and a kayak. Last fall, we had scoped out a few remote camping sites on the Waterbury Reservoir, which seemed to be good possibilities for a quick overnight trip, on the spur of the moment. These sites do not require reservations, and are often filled up on weekends. However, we happened to have 2 midweek days available, it was still early season…so we decided to head out and camp out! Our gear is organized in a gear room—we have a checklist we follow, so we were quickly able to gather our gear, load up, and go. We decided to attempt a launch from the Cotton Brook canoe access. Unfortunately, this launch site suffers a bit from the vagaries of seasonal erosion, low water levels, paddle-choking invasive weeds, shallow mud flats, and unpleasant grime and slime on the water surface. .. but it is only 5 miles from our home, so if conditions are favorable, it is a convenient option. The parking area was unusually empty, and there was only one other paddler in the area, a fellow on an SUP, who we let head out before us. Paddling conditions were sweet, the sun was shining, and though winds were variable, they did not hinder our progress. We arrived at our destination, a campsite on a piney bluff, 40 feet above a beach area. The dogs loved to get a chance to run along the beach. At the campsite, we immediately realized that prior occupants did not follow the principles of Leave No Trace. We found garbage in the fire pit, shiny metal screws in the side of a large tree, and scraps of paper, plastic, and clothing left about. 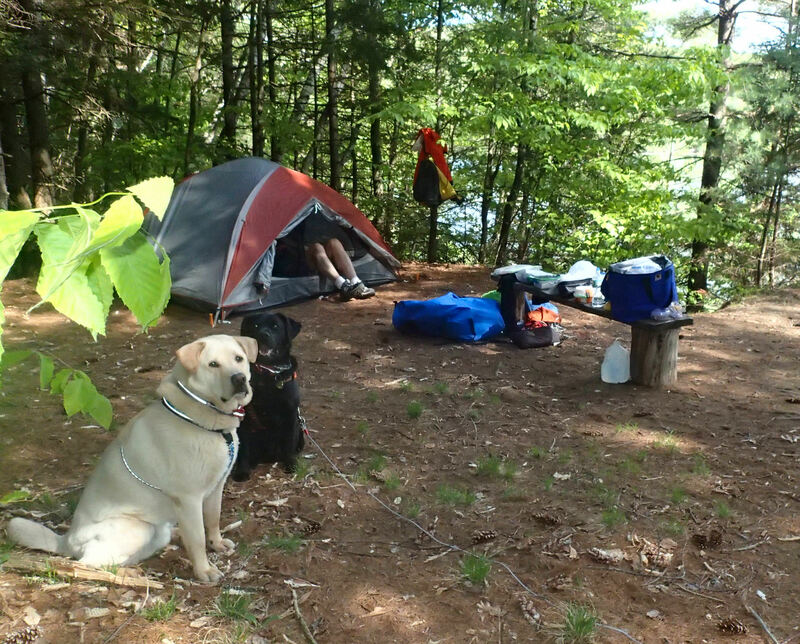 We did our part, cleaned it up ( and recorded the data on the Friends of Waterbury Reservoir Project Data Collection card)…we then had a great campsite, overlooking the water. We were able to explore the rocky shoreline, finding a great swimming area for later in the season, when the water is a bit less cold. As we walked along the beach, a loon suddenly popped up, 25 feet off shore. We had seen a solitary loon as we paddled in, but that had been quite a ways north, so this was probably a different bird. Loons have faced challenges on this lake, since the water levels vary greatly, and their nests (and eggs) are especially vulnerable to water level fluctuations. The weather stayed delightful, cool but not cold, and minimal invasion by bugs. Gryphon, as usual, could not wait to get into the tent! We had not brought his dog tent this trip, so I gave in, and permitted him to go inside the tent around 8pm. 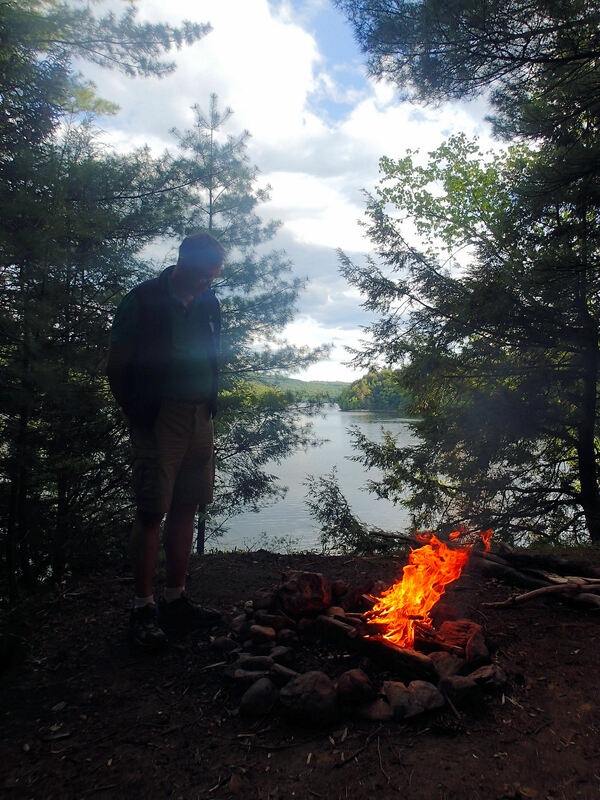 It was a great feeling to once again be sitting by a crackling fire, with the calm waters beyond…we saw no other people, and heard only barred owls, loons, and numerous chirping critters. The next morning, we made a nice hot breakfast, and headed out on the calm early morning waters. 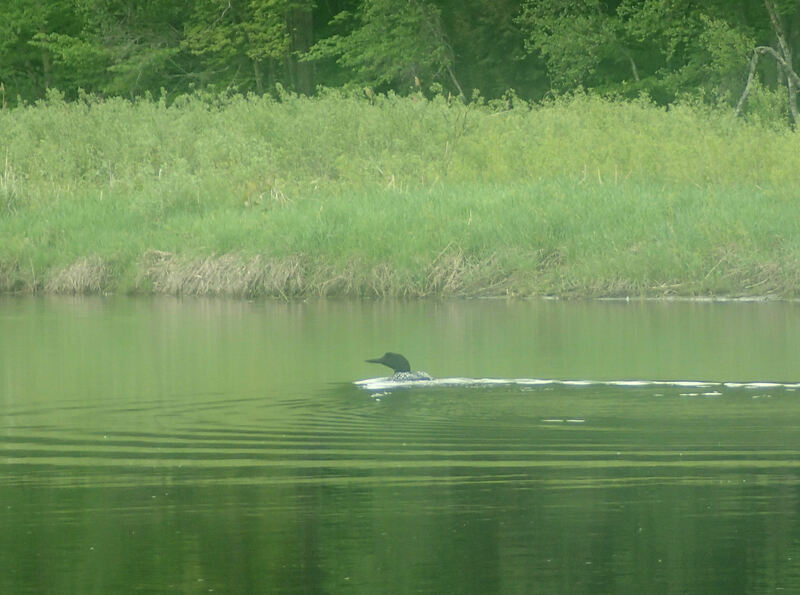 We encountered a pair of loons; from a distance we could see them taking off and landing on the water—quite a sight! As we neared the channel back to the launch, the loons were hanging out on the starboard side of our boat…they seemed oblivious to us, and we kept our distance the best we could. As we approached the launch, we observed the distinctive flight of a bald eagle, swooping over us, as he headed out to the river ( and his own breakfast). It was great to see an eagle once again! So we head into the Memorial Day Weekend, wondering what our plans will be. 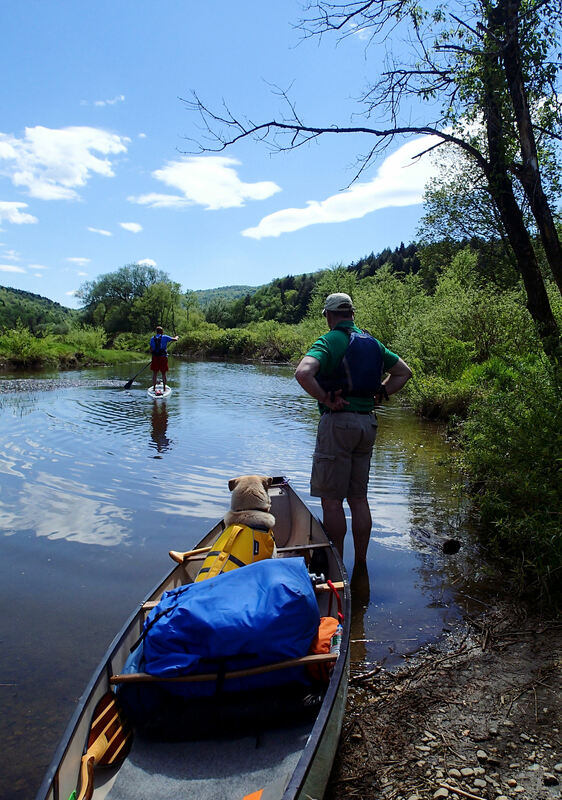 We will seek to avoid the popular tourist areas, and hopefully head into some more isolated parts of Vermont, for paddling and hiking. Oh, and of course, we need to take that new kayak out for a spin! We have been fortunate enough to reap the rewards of winning a few blog giveaways, so now it is our turn to share the wealth. This is our first giveaway, so we are limiting it to legal resident of the U.S., at least 18 years of age. Sincerest apologize to our friends in Canada, and we hope that our next giveaway will include you folks as well! 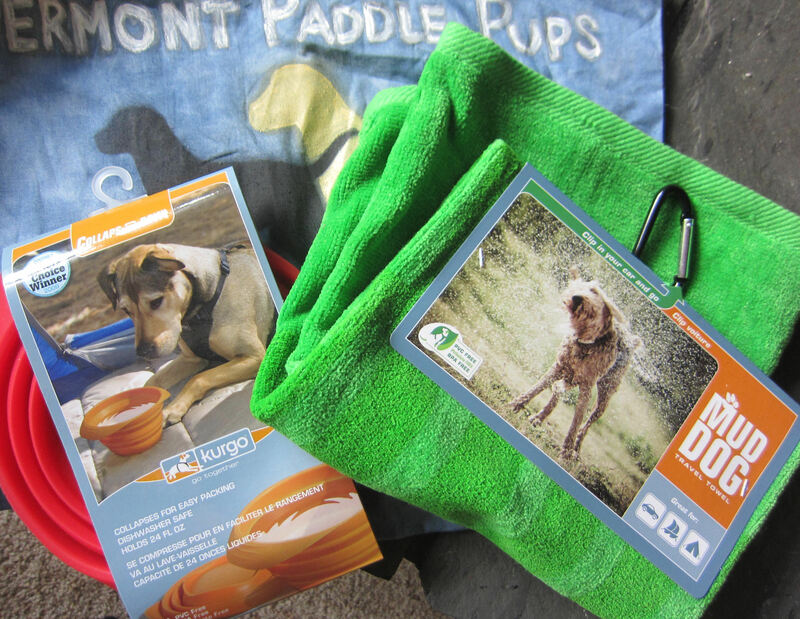 Our giveaway prize is a Kurgo Mud Dog Travel Towel, along with a Kurgo Collaps A Bowl (red). 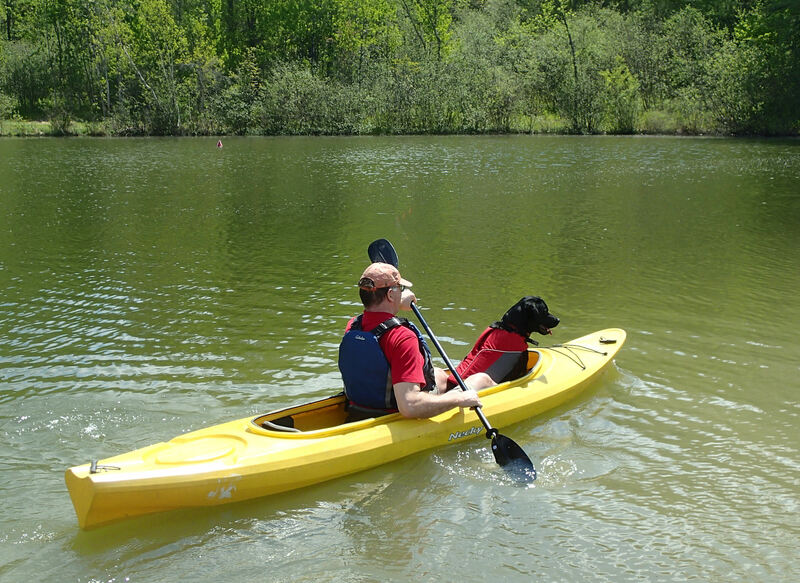 To enter, simply leave a comment on this blog post, telling us your favorite dog paddling location…if you don’t paddle with your dog (yet! 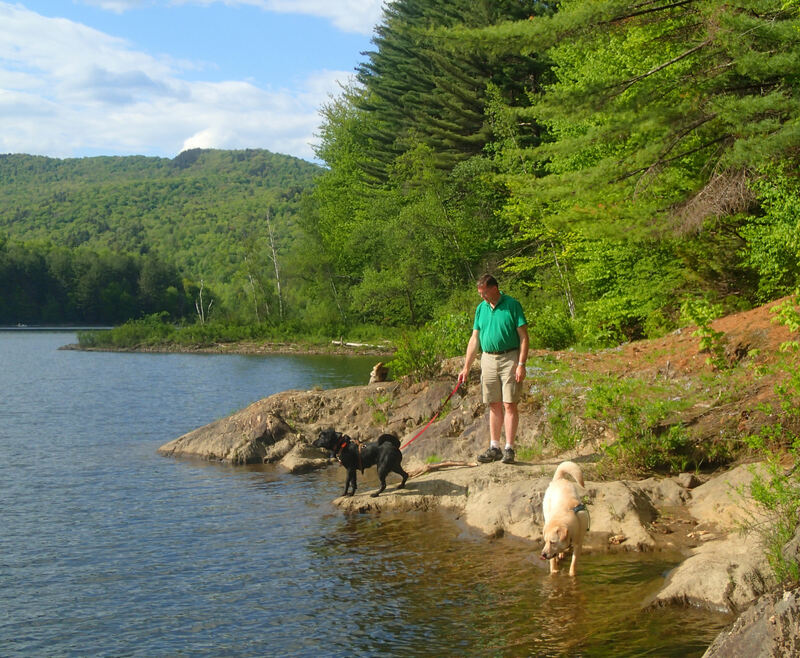 ), tell us where you might like to take your dog for an adventure. The winner will be selected at random, from comments made between 6pm EDT on May 22, 2015, and 6pm EDT on May 31, 2015. 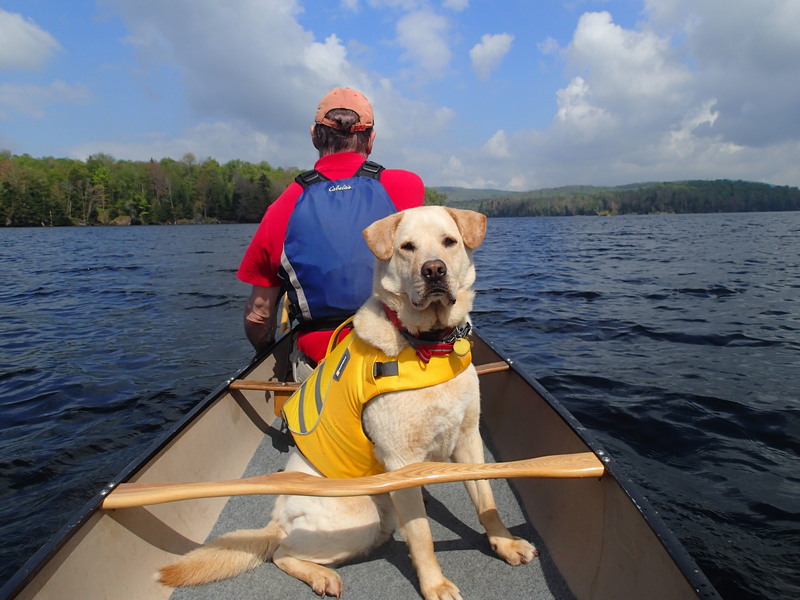 ← The loons are back on the water… and so are the Paddle Pups! 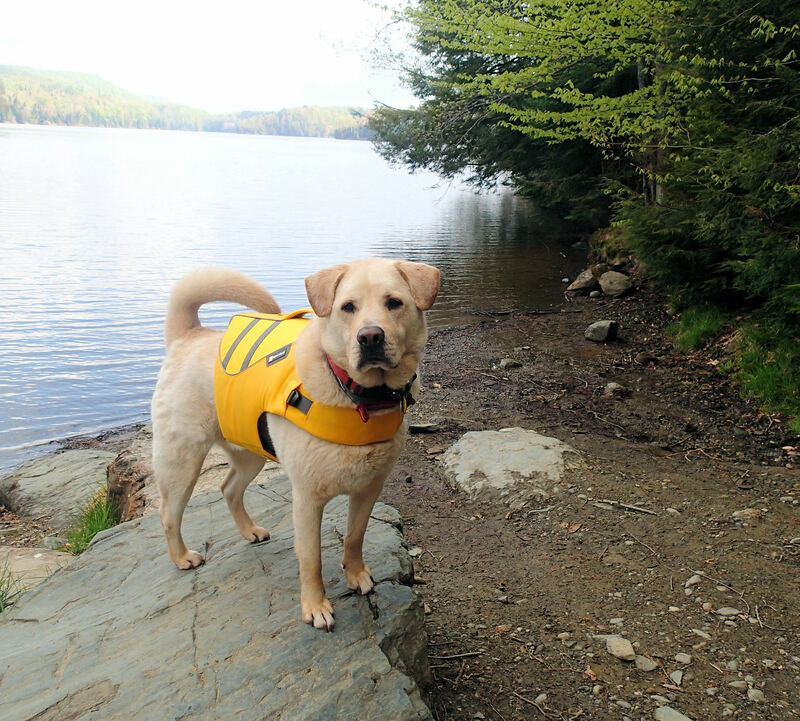 We love taking our dog Denali, in our canoe to our favorite local spot: Leigh’s Mill Pond in South Berwick Maine. We live on the border of NH & ME. Denali’s only 4yrs old and she’s still learning how to be a good boat dog. We look forward to many more years out on the canoe with her! Love your blog! Thanks for sharing! Happy Paddling, Denali! Just for giveaway purposes, be sure to follow up on your comment after 6pm ( It’s our first giveaway, so we want to get it right!) 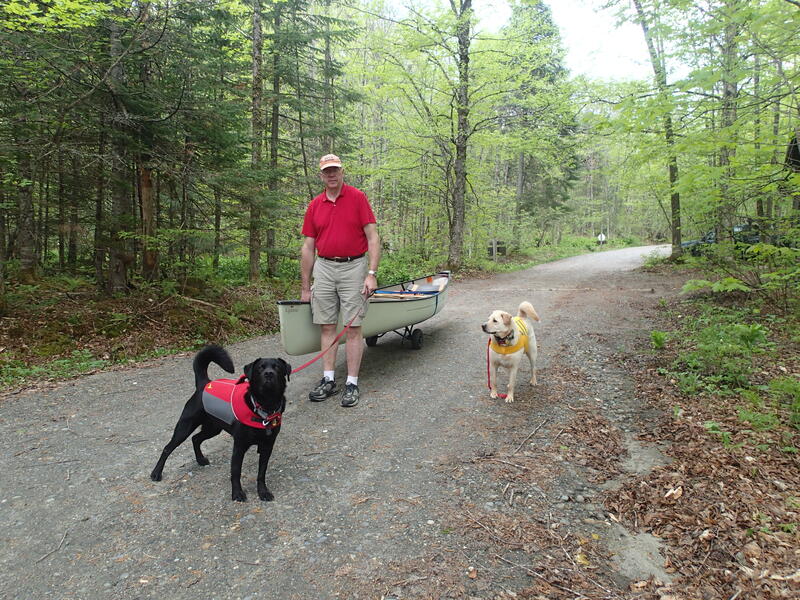 We love paddling in Maine! HAHA! Guess I didn’t read the instructions very well! We really love getting out on the boat with her and hope to take a canoe trip up Maine later this summer. Love your blog! What an exciting adventure for your family! I’ve never taken my 2 White German Shepherds paddling. If I could, I would take them somewhere along the New England or Florida coastlines. Thank you for sharing your good times and good fortune with us! Beginners Away! Me and Red, my lovely mutt puppy are still having grand adventures in the woods. This past weekend, I decided that we were going to give paddling a beginner shot. We commandeered my young nephew’s pontoon boat grab up the paddle, our PFDs and struck out around our pond while the kids jump, whooped and hollered and cheered us on. I was nervous Red would back out, but once I was in the boat and settled and whistled for him, he was right there by my feet. 🙂 So at this point, our favorite paddle location is our little pond right in our yard. You have to start somewhere! Sounds like a great day! I enjoyed your blog! 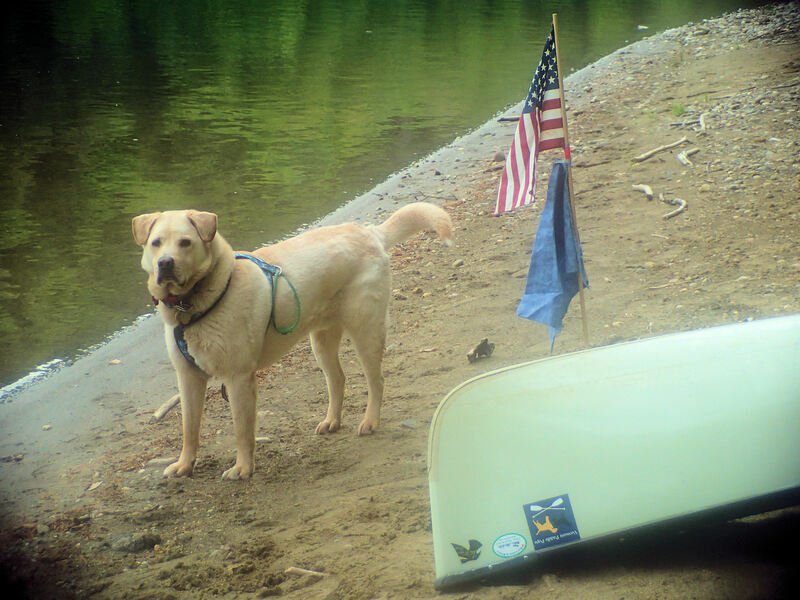 I’ll be taking my pup Dove on our first paddling trip to the Boundary Waters in 2.5 weeks. We’ve been backpacking and have gone on day trips in a canoe, but it’s about time we combine the two. I’m looking forward to it! Well, Mitch, I hope you can use a camping dog bowl and mud towel, because you are the winner! 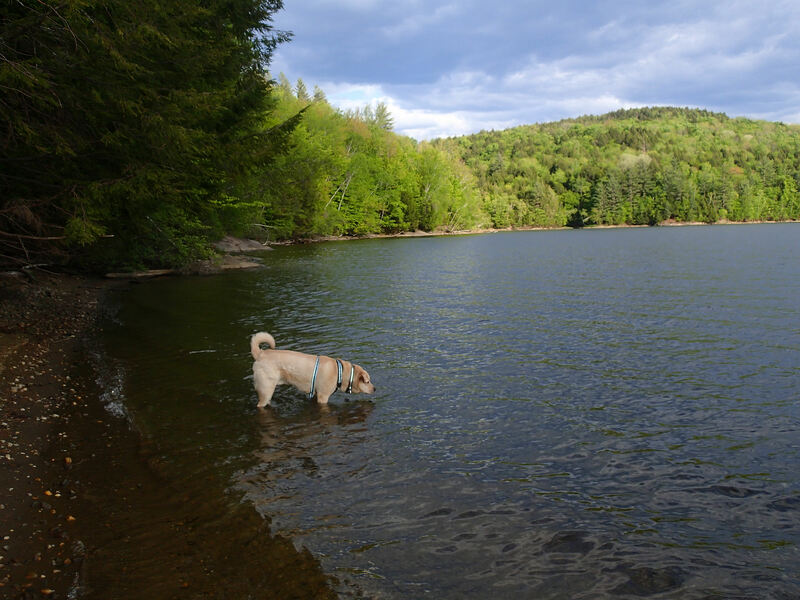 Send your address in a PM to the Vermont Paddling Pups facebook page, or a DM to our twitter @VTPaddlePups, and I’ll get that sent right out to you. Congrats ,and thanks for participating. I just bought my first kayak (though I’ve paddled before) and our PFDs just came in the mail today! We will be hitting up as many of the Pennsylvania state parks as we can this summer! Planning on buying a kayak sometime very soon! When I get one I plan on taking my black lab to Eastern Washington to explore the other side of my state in one of my favorite places, Leavenworth! I went to grad school in eastern WA(WSU)…we’ve discovered that black labs love kayaks! Amazing pics and I would love to win the giveaway of cool dog items! My favorite paddling location is along the sound side of the Outer Banks of North Carolina. I haven’t actually gone paddling with my dogs yet, but I have camping reservations for Green River Reservoir for a weekend in July! We just got back from camping at GRRSP! We go there a lot, but usually mid-week…. 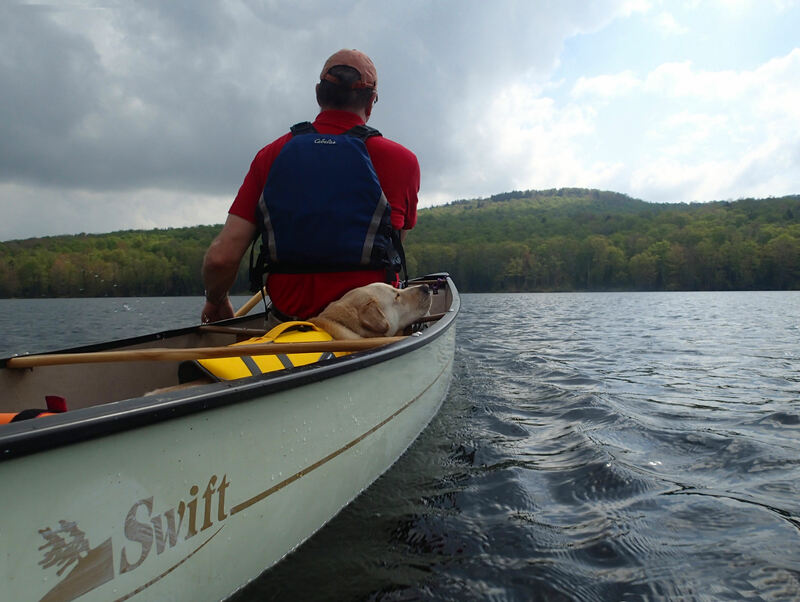 Daisy, the canoe dog, isn’t particular about where we should go for adventures — either someplace with water (and duckies!) or someplace on land with squirrels. Most of our canoe adventures are throughout the Boundary Waters Canoe Area Wilderness and Quetico Provincial Park. Our favorites have been the two-week fall trips — fewer people, no bugs, comfortable temps, and lots of color!